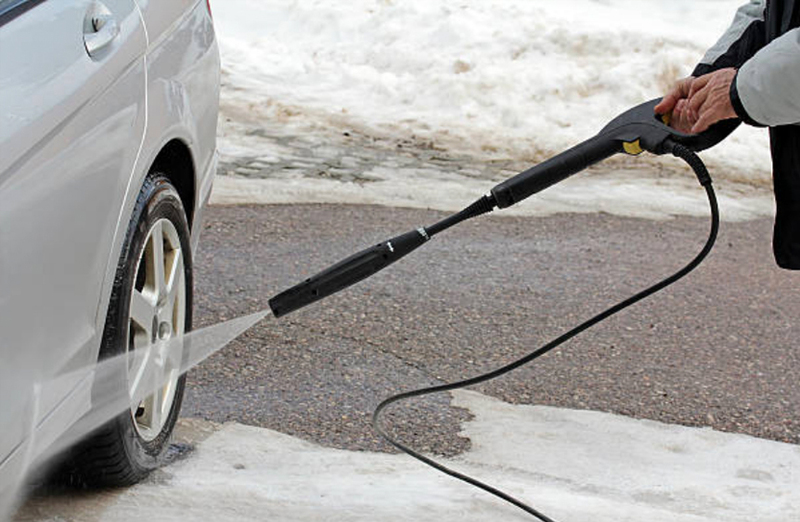 What to look for in a Pressure Washer - PSI, flow rate, accessories, etc! Power washers are amazing tools. Choose one that fits your needs! A pressure washer needs.. well, pressure. Which is why PSI is one of the top characteristics you should look at when shopping for a high quality power washer. A higher PSI, combined with the flow rate (discussed below) will clean surfaces and remove gunk and grime with more efficiency and less time. You’ll want to choose the right PSI for the job. Light-duty applications like washing a car, cleaning furniture, etc.? Stick to the 1,000 – 1800 PSI range. Cleaning sidewalks or patio decks? Step up a grade to the 2,000 – 3,000 PSI models. And lastly, if you need heavy duty cleaning power for removing graffiti or stripping paint off metal, wood, and concrete, look into the 3000+ PSI pressure washers. GPM is the ying to PSI’s yang. It is the force of the water that does the tough task of washing (and not air), therefore the water flow rate is equally important when seeking out the top pressure washers for your job. 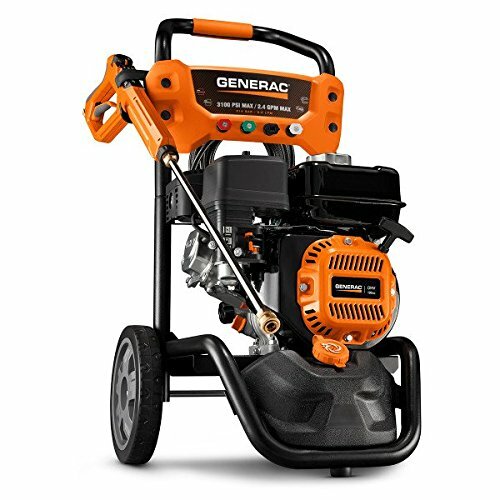 Typically, electric power washers will vary between 1GPM and 2GPM, whereas gas powered pressure washers may reach up to 4GPM. A good rule when comparing similar pressure washers is to simply multiply the GPM by the PSI. For instance, a 1900 PSI, 2GPM power washer (1900*2=3800) would most likely perform better than a 2000 PSI, 1.75GPM power washer(2000*1.75=3500). 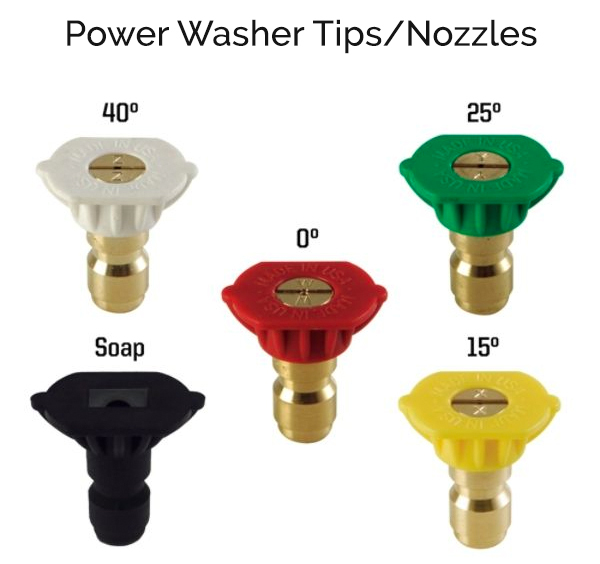 Once you find the power and flow that fits your needs, the next step is to decide on which power washer accessories or parts are important to you. Certain models offer a variety of tips that fix to the end of power washer wand, allowing you to change the dimension and power of the spray. Others have an integrated adjustable nozzle so you don’t need to fuss with changing them out or losing the individual tips. 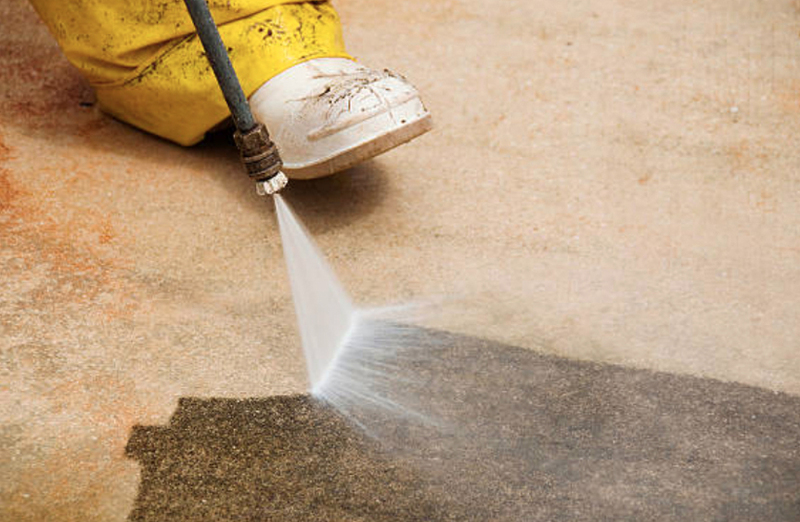 If the sheer power of water in all of its wet fury is not enough to clean a given surface, you can integrate specialized pressure washer soap into the mix. 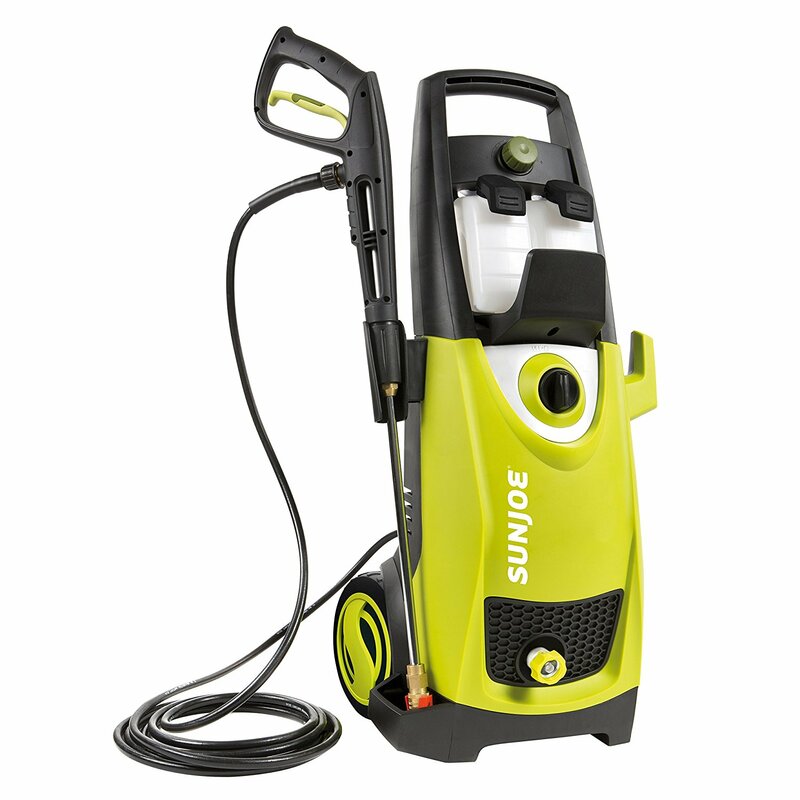 Some pressure washers will have a dedicated detergent tank integrated or included separately. Most gas pressure washers, however, simply have a detergent injector hose that you insert into a nearby bottle of power washer detergent. Be aware of how you plan to use your new power washer, as this may determine which you end up buying. Most electric pressure washers are vertically-oriented (like a small upright vacuum cleaner), meaning they store relatively compact. Gas power washers might be a little shorter and bulkier, and most notably – heavier. Pressure washers can range from 15 lbs all the way up to 200+ lbs for commercial models, and are available in a variety of sizes. If you are going to pilot these washing wizards yourself, think about how many pounds you are willing to drag around, especially if its over tall grass or up/down stairs. 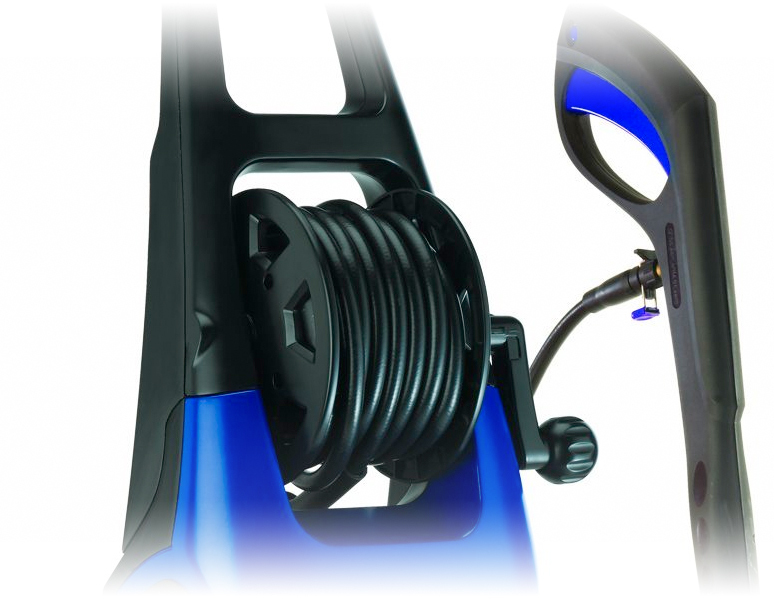 Since a power washer will spend most of its life stored out of sight, one feature we find convenient is a pressure washer hose spool (such as on the AR Blue Clean), which makes cleaning up quicker, protects the hose, and keeps your garage tidier.